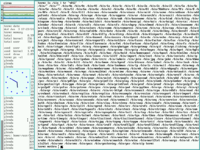 This page maintains a list of operating system projects considered to be notable. 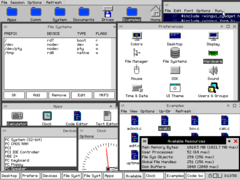 An operating system is considered notable if it has received some form of success outside of the relatively tiny sphere of hobby operating system development (e.g. has had a full release, is self-hosting, has been reported on outside of the hobby OSdev world, etc.) or if it has achieved such notability within the operating system development community as a useful answer to the question, "I want to see what kind of operating systems you guys have built"
If you believe your project meets one or more of the criteria above, feel free to add it to the list. The worst that could happen is you fall out of notability due to inactivity. Plan9front (or 9front) is a fork of the Plan 9 from Bell Labs operating system. The project was started to remedy a perceived lack of devoted development resources inside Bell Labs, and has accumulated various fixes and improvements. BareMetal is a 64-bit OS for x86-64 based computers. The OS is written entirely in Assembly while applications can be written in Assembly or C/C++. The two main purposes of BareMetal are for educational uses in learning low-level OS programming in 64-bit Assembly and to be used as a base for a high-speed data processing node. Source code is well documented and freely available. As of version 0.4.9 BareMetal OS officially supports multiple processors, memory management, and Ethernet communications. Today, FreeDOS is ideal for anyone who wants to bundle a version of DOS without having to pay a royalty for use of DOS. FreeDOS will also work on old hardware and embedded systems. 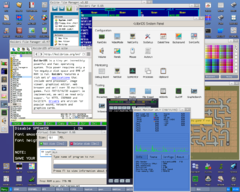 FreeDOS is also an invaluable resource for people who would like to develop their own operating system. While there are many free operating systems out there, no other free DOS-compatible operating system exists. Open-source operating system for Texas Instruments calculators. Features preemptive multitasking, memory management, etc. Written in z80 assembly. An open source embedded multiprocessor kernel for ARM, x86, x86-64. Other platforms are work-in-progress and are in various stages of development with varying activity. SeaOS is a hybrid kernel with loadable modules that supports ATA, AHCI, EXT2, ELF, and many other fancy acronyms. It has basic networking support, initial VT-x support, and is self-hosting with a fairly complete unix-like userland. Designed for simplicity. 32-bit modular kernel written in C. Supports pipes, shared memory, signals, POSIX-compliant file access, threading, audio, IPv4. 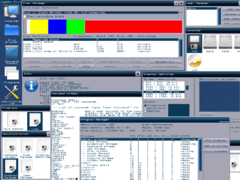 Heavy focus on advanced GUI, including a compositing window system. This page was last modified on 26 February 2019, at 04:22. This page has been accessed 15,906 times.